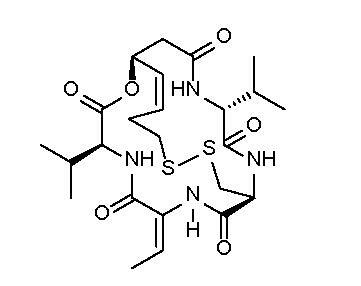 Romidepsin is a potent and selective inhibitor of class I histone deacetylases (HDACs), IC50 = 36, 47, 510 and 14,000 nM for HDAC1, 2, 4 and HDAC6, respectively1. Induces apoptosis in a variety of cell lines2 and displays antitumor activity in mouse models3. Recently approved for clinical use in T-cell lymphoma4.